Many songs seem to have no meaning, ie have you ever wondered what MacArthur Park is all about. I hope you know now as I wrote about it on this website back in October 2011. It does have a story. What about Zoom by Fat Larry’s Band? No, not sure about that one yet! This week’s subject is possibly one you’ve never thought too closely about as it’s become a classic over the years and most will know most, if not all the lyrics. But according to the song’s co-writer, who compares it to an episode of The Twilight Zone, where says it jumps from one scene to the next and doesn’t necessarily make sense. He says the success of the song comes from the audience creating stories in their minds based on the images. That song is Hotel California. As explained by my Number One’s co-author, Spencer Leigh, The Eagles took over from the Beach Boys as the only key exponents of California Rock, and like them, they became the victims of the California lifestyle. The Eagles formed in 1971 and the line-up altered a number of times of the years, but Don Henley and Glenn Frey were the mainstays. As it happens only two member were actually from California and they were later member Bernie Leadon and Timothy B. Schmit. Joe Walsh came from New Jersey, Don Henley was from Texas, Glenn Frey was from Detroit, and Don Felder was from Florida. By 1976 the line-up was Henley, Frey, Don Felder, Joe Walsh and Randy Meisner and they teamed up with producer Bill Szymczyk and recorded the album Hotel California. The song was written by Don Felder, Glenn Frey and Don Henley but the order of the names had its share of problems. Henley recalled, Felder had some problem with how the credits were listed on this new version – the original single had the composers as Don Felder, Don Henley and Glenn Frey, implying that Felder wrote most of the song and Frey the least.” The new version was credited to Don Henley, Glenn Frey and Don Felder. Felder claims that Henley and Frey added nothing original to the new version, and that this was simply a power play. Don Felder came up with the musical idea for the song. According to his book Heaven and Hell: My Life in The Eagles, he claims he came up with the idea while playing on the beach. He had the chord progressions and basic guitar tracks, which he played for Don Henley and Glenn Frey, who helped finish the song, with Henley adding the lyrics. Felder says they recorded the song about a year after he did the original demo, and in the session he started to improvise the guitar part at the end. Henley stopped him and demanded that he do it exactly like the demo, so he had to call his housekeeper and have her play the cassette demo over the phone so Felder could remember what he played. The line ‘They stab it with their steely knives but they just can’t kill the beast’ is a reference to Steely Dan. The bands shared the same manager (Irving Azoff) and had a friendly rivalry. The year before, Steely Dan included the line ‘Turn up the Eagles, the neighbours are listening’ on their song Everything You Did. 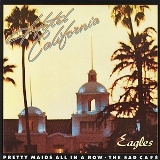 The hotel on the album cover is the Beverly Hills Hotel, known as the Pink Palace and was regularly frequented by Hollywood stars. The photo was taken by photographers David Alexander and John Kosh, who sat in a cherry-picker about 60 feet above Sunset Boulevard to get the shot of the hotel at sunset from above the trees. The rush-hour traffic made it a harrowing experience. The song, which ran to just over six and a half minutes, reached number eight in the UK but topped the American single chart. It won the 1977 Grammy for Record of the Year but the band did not show up to accept the award, as Don Henley did not believe in contests. Timothy B. Schmit, who had just joined the band, said they watched the ceremony on TV while they were rehearsing. The band split up in the summer of 1980 and when asked if they would ever think about getting back together, Henley “not until Hell freezes over.” But they band did reunited in 1994 and recorded an even longer live, acoustic version of the song for an MTV special that was included on their album Hell Freezes Over. Don Felder came up with a new guitar intro for this version the day they recorded it, and while it was not released as a single, it got a lot of airplay and helped the album top the charts the first week it was released, and was nominated for a Grammy for Best Rock Performance by a Duo or Group with Vocal. Felder was fired from the band in 2001 after disputing payments and royalties, but quickly responded by filing two lawsuits alleging wrongful termination, breach of implied-in-fact contract and breach of fiduciary duty and was seeking $50 million in damages. Another 13 years had passed until they released their next album which was Long Road out of Eden in 2007 but in the U.S it was only available via the band’s website, at Walmart, and at Sam’s Club stores, everywhere else in the world it was available via all the traditional outlets.